The aim of any follower of Jesus should be to draw closer to Him. We are disciples and disciples are followers, learners, and imitators. We live to be more like Jesus and share more of Jesus in all we do. It’s clear how we do this in ministry or spiritual disciplines or evangelism. But what does it look like in work or in creative ventures – art, music, film, writing, design, entrepreneurialism, philanthropy, volunteerism, and more? How can creating draw us closer to God? Here are ten ways. What does it mean to be created in the image of God? The answers are too many to list or explain, so let’s just focus on one: created. We were created in the image of a creator. To use the active voice, the Creator created us in his image. This means, in part, that God created us to create. Humans are unique in all creation as creators, as artists, as envisioners and imaginers. This is God’s image in us, and as we create that image becomes clearer. Only God creates from nothing; the rest of us create using the world God created. That means we need to know this world, to consider God’s creation. The best creators are those who observe the most keenly. And those who observe the most keenly are seeing something of God’s handiwork in a unique way. As we see and consider creation we find ourselves relating to it differently. I don’t mean this in some sort of pantheistic, god-in-everything way. I mean that we gain appreciation for aspects of creation we previously had never noticed or cared about. We find ourselves drawn to new things for inspiration or to new places for reflection and rest. We find new genres and styles of art speaking to us. In all of this echoes the voice of God and on all of this lies His fingerprint. Appreciation for creation, in its proper place, is appreciation for the creator. When God created the earth He did not do so in isolation. He did so with His Trinitarian self. If that sounds mind-bending and confusing that’s ok – it is. God’s fellowship within Himself is one of the most mysterious, wonderful, and marvelous aspects of who He is. What it means for us is also wonderful and marvelous: we are not created to be isolated beings. Our image bearing is communal, especially because no one of us can reflect even an iota of who God is by ourselves. We need each other, and one way we connect is through creating. Art draws art lovers together. Collaboration enhances each other’s efforts. Music and film are celebrated and enjoyed with others. We can create by ourselves, but creativity at its fullest is a connecting bond between people. 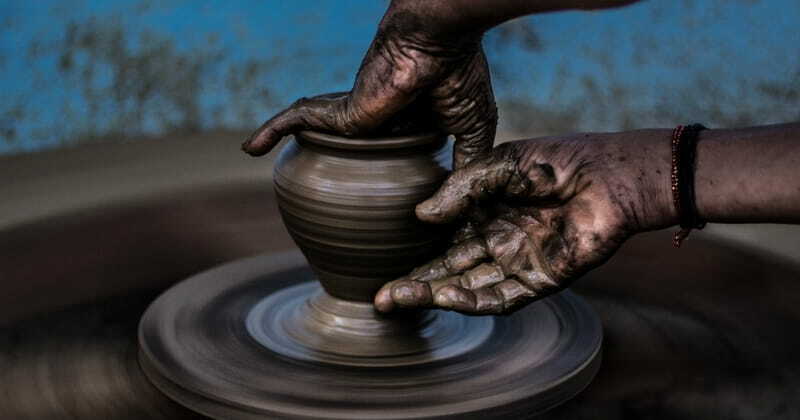 A potter can make the same pot over and over again. A composer can write the same chord progression ad nauseum (just listen to modern worship music or pop country tunes). A journalist can take the same angle on every story or harp on a single cause piece after piece. But at some point, these creative efforts stop being creative and simply become production of a product. The best creativity is curious – it explores and discovers new styles, truths, realities, places, people, stories, images, and other reflections of God’s handiwork. If we want to continue in creativity we must continually seek out new opportunities and influences, and as we do we encounter numerous opportunities to appreciate the almost seemingly infinite depth of creative variety in God’s world. God has limitless goodness, power, and creativity. His “wondrous knowledge is beyond me.” (Psalm 139:6) “He spoke, and it came into being” (Psalm 33:9) – the entire universe created with a few syllables. While it’s obvious that we do not hold this same power our sinful hearts never cease to believe that maybe just maybe we would be better off if we were lord of our own lives. But then we try to create. We burn dinner, we crack the sculpture, we smudge the painting, we miss a note, we overlook a flaw. Our creations are imperfect. The best work we ever do may be brilliant, but all the blood, sweat, time, and tears we poured into it can’t bring it to the level of genius God showed by creating the heavens and earth, the fish of the sea and the birds of the air, the night and day. He speaks sublime creation into being while we sweat and strive and seek to reflect just a fragment of that with our work. Our limitations and flawed work are a reminder and invitation to revel in the majesty and genius of God. To call an artists work “derivative” is an insult. It means it was drawn from someone else’s work, a poorly disguised imitation, and possibly a theft. But every creative effort we put forth is derivative of God’s work. He made everything from nothing – every shade of color, every musical scale, every syllable and metaphor, every medium, every idea. All we do is work with what God created. All we do is use the ideas and vision he gives us the ability to see to spin His creation into new forms. Our deriving is an honor to God, and when we recognize from who we receive our abilities we find a new connection to Him as First Creator. Just as we derive all creative ability and opportunity from God so we depend on Him for it. Our minds depend on Him for ideas and clarity and truth. Our hearts depend on Him for inspiration and passion. We depend on Him for circumstance providing opportunities. Even as we diligently work we recognize that any success is a gift from God. He is the provider of everything from idea to effort to materials to opportunity to response. What a gift. The creative process mirrors spiritual growth in many ways. Creators are either improving and expanding or they are stagnating. Creativity takes discipline and purpose. It thrives on inspiration and community. It depends on more mature and learned people to teach and set examples. Pride kills it while humility and willingness to correct mistakes and learn from them ignites it. One person’s discovery and growth can spark discovery and growth in others. See? The similarities are striking. The best creative efforts express truth. This doesn’t mean they make statements; it means they reflect aspects of God and God’s will for the world. As we’ve seen creativity itself is a reflection of God, but when it is done in dependence on Him and with intentionality it will express even more: beauty, lament, healing, grace, justice, mercy, stewardship, and so much more. Some creative efforts use words and statements to express truth clearly. Others use images and sound to draw people’s hearts and imaginations toward God. Both are expressions of truth about God and what God intends for His people and His world. Barnabas Piper is the author of three books and co-hosts the popular Happy Rant podcast. He blogs at BarnabasPiper.com, and writes for He Reads Truth as well as contributing to numerous other websites and publications. Piper also speaks regularly at churches and conferences around the country and lives in Nashville where he works in publishing.